Eight of our BRDC SuperStars were invited to the Get Race Fit 2014 extreme fitness course held at the Porsche Human Performance Centre at Silverstone last weekend (1-2 March). 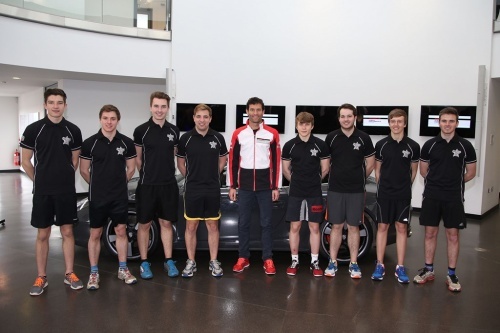 BRDC SuperStars Ben Barnicoat, Jake Dennis, Joe Osborne, Jordan King, Matt Parry, Oliver Rowland, Tom Ingram and Tom Sharp were joined by Tim Harvey, Director BRDC SuperStars and former Formula One race driver Mark Webber. As well as the training preparation the SuperStars took part in the communications workshops and Q&A sessions. Joe Osborne "The weekend spent at the Porsche Human Performance Centre was an excellent chance to refine some pre-season training. It also came with some good competition against the other SuperStars and Mark Webber. Having Mark on hand and hearing his advice was really beneficial, and meeting Porsche legend Richard Attwood also gave us the chance to see what a career in motorsport needs from a fitness perspective."